The Grand Gas Firetable is a high-top gas burning, focal point. 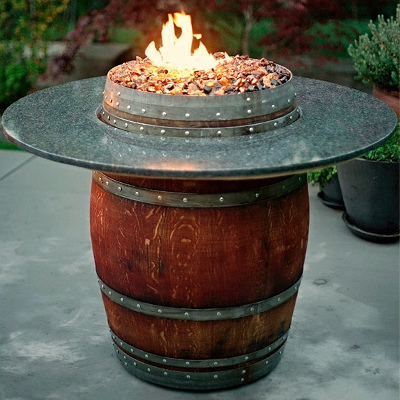 Who wouldn’t want to gather in around this unique firetable and enjoy a glass of wine! Optional tops include: Granite, Vintage Wine Crates or a recycled Wood Slave Top. All of the bases are made from full recycled authentic wine barrels. A standard 20lb propane tank fits perfectly underneath the unit (tank not included) and a matching wood cover with handles is also included. Includes a vinyl weather cover. Come see it burn!